OcUK offer a wide range of gaming machines, designed to match any budget. We looked at the Cobalt a few weeks back, offering a rather modest specification; today we crack open the OcUK Oxygen, featuring a 6-core Core i5 8600K CPU, AMD RX VEGA graphics, M.2 SSD storage and watercooling on the CPU. This machine certainly promises performance at every turn. The Intel Core i5 8600K CPU has been overclocked to 4.8GHz across all 6 cores, paired to which is 16GB of DDR4 memory; both of which will help with multi-tasking and pushing frames to the monitor. 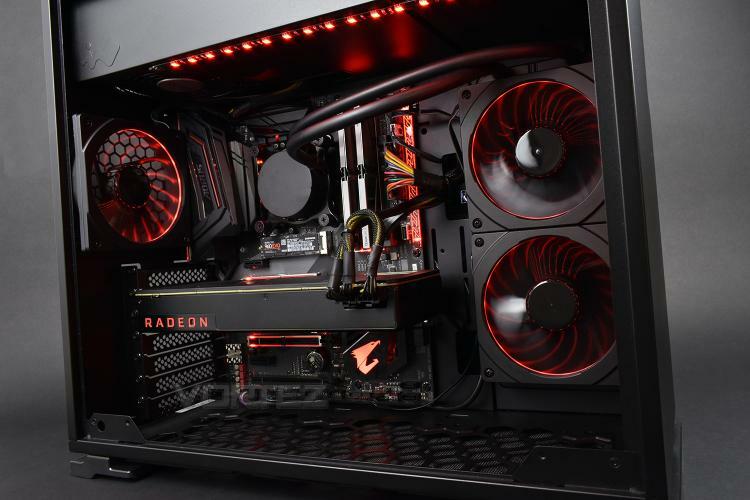 Supporting all of your graphics demands is the AMD’s latest generation of graphics processors, built on the 14nm FinFET architecture, the RX VEGA 56. Featuring 8GB of HBM2 memory and 3584 stream processors with a boost clock of 1471MHz. Storage is handled via a marriage between spinning media and solid state in the form of a 500GB Samsung 960 Evo M.2 and a 2TB Seagate 7200RPM SATA drive – offering both blisteringly fast speed on the M.2 SSD and ample storage on the HDD. All of those lovely components are encased within the InWin 101 Gaming Case, illuminated by internal red LED strips and features a top chamber for better airflow to the PSU as well as an incredibly sleek yet appealing appearance. Intel’s 8600K paired with AMD’s VEGA 56 should be ample for 1080p and 1440p gaming, but can it handle 2160p at a decent framerate? Read on to find out. The OcUK Gaming Oxygen is a great value, configurable gaming PC based around an Overclocked Six Core Core i5 8600K Processor and AMD RX VEGA series graphics! Hand-built, hand-tuned and tested by our highly trained technicians, the OcUK Gaming range uses only our finest components to match aesthetic brilliance with epic performance!